National Park Service bans a book out of fear of offending Roosevelt’s Memorial Association and family – the definition of censorship and first amendment violation. I can’t say I’ve courted controversy as an author. A historian’s daily schedule is, after all, hardly the same as a Fox or MSNBC commentator. But sometimes controversy finds you. 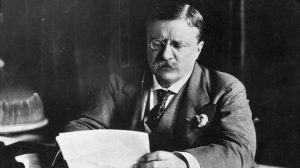 As I wrapped up my latest book, TR’s Last War: Theodore Roosevelt, The Great War, and a Journey of Triumph and Tragedy, I re-visited a rather minor footnote detailing the suicides of two of Roosevelt’s more prominent business supporters.Then, I recalled TR’s son Kermit had to talk TR out of ending his life with a morphine overdose on their Amazon expedition and how Kermit himself committed suicide in 1943. Suicide ran through TR’s family tree. He himself was not only manic but also highly depressive. He carried morphine with him on his various expeditions with him so as to end his life if circumstances demanded it. As he neared death in January 1919, he suffered excoriating pain, faced life confined to a wheelchair, could not even write his own signature—and, perhaps, worst of all, had recently endured the death of his beloved youngest son, Quentin, in a war that he had so forcefully argued for America to join. The evening of his death, a nurse injected him with morphine. Had TR later ingested more of the drug to finish off the job—and himself? The symptoms he exhibited in his last moments are symptoms consistent with a morphine overdose. And, so, I presented all this information as gingerly as I could—as tantalizing speculation rather than as established fact—and wrestled very strongly with the issue of whether I should present it at all. But, finally, I realized that I would ill serve my readers if I dared not do so. It is impossible to know what happened. We surmise what we can. We dissect what evidence exists of our subject’s final actions and the hints—no, not defining proof, but, certainly, the ample hints—of means, motive, and opportunity. We dare not present a final answer. But we do respectfully present these facts. “What I have found remarkable is that infirm people want to hold onto life,” a friend has commented to me, “it’s the young Gods who destroy themselves. I think [Roosevelt] would have consider it a coward’s way out.” Many readers, perhaps, most, may agree with that assessment; others may disagree. We respect either conclusion—or those reaching no conclusion at all. If, however, in those last moments, Theodore Roosevelt gave in to despair, let our knowledge of that—or even our mere suspicion—enable us to better appreciate the price of his glory. But, what if he had withstood grief, pain, and, even, heredity to firmly fight unto death? Such a last ounce of courage—that last war—would, indeed, be Theodore Roosevelt’s grandest triumph. And so the book went to my editors and to press. 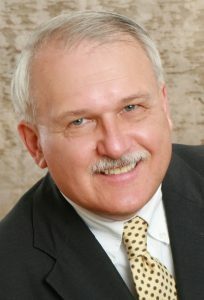 I set upon my work of arranging speaking engagements, including venues directly connected to Theodore Roosevelt’s life. Eventually, I received an email from the National Park Service, which operates the Theodore Roosevelt Birthplace on Manhattan’s East 20th Street. They wanted to schedule a phone call. I thought that odd but gave the matter little further thought. Why not, merely, just schedule a date and time for my appearance via email? This is 2018, after all. But, yes, I’d schedule a call. I thought it was about speaking at the Birthplace. 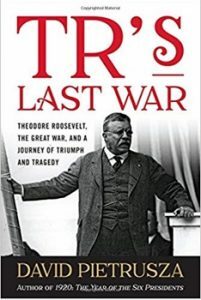 The call focused about stocking—or not stocking—copies of TR’s Last War at the Birthplace’s bookstore. Frankly, I hadn’t even given that any thought at all. I didn’t recall their book selection as being particularly large. In fact, it seemed rather modest. TR’s Last War could not—or would not—be stocked. It would not be carried at the site’s bookshop because of its content. The NPS cited three reasons for unease: 1. No one else had written about the situation previously (reasoning akin to “Sorry, Mr. Copernicus, but . . .”); 2. Fear of offending the Roosevelt Memorial Association (which had donated the site to the federal government); and 3. Fear of upsetting the Roosevelt family. Which translated into the banning of my work by a federal agency. I was further informed that I could not be kept from speaking at the site (that didn’t sound exactly welcoming), but I could not appear when it was open to the public, i.e. before 5:00 PM (again this struck me as less than welcoming as I myself have attended a slide show at the site). I could, however, apply to rent the venue—at $80 per hour, after I filed a $50 application fee. I was told information on that would be sent to me the next morning. This did not strike me as the best speaking gig I had ever been offered, but I mumbled my assent to receiving the email. Nothing followed. But the realization of what had transpired quickly sunk into my previously rather stunned brain. I have had some time to reflect on our conversation of yesterday afternoon. I think I was a bit taken aback by the news you conveyed. But I now have some further thoughts. You, of course, have the right to stock whatever books you wish at the Theodore Roosevelt Birthplace. But when a decision is made not to carry a book based not upon its sales potential but rather upon its content, and in this case, not even upon any thesis within it (because I do not state any conclusion) but upon the facts presented therein, that decision can only be described as banning the book in question. When the government (and the NPS is a government agency) bans a book, that decision is even more problematic. That you chose to convey that decision to me not in writing but via a phone conversation (obviously so as not leave a written trail), this indicates to me that you recognized the problems with that decision. As I noted to you, my decision to write and publish the Epilogue in question was not an easy one. I had no wish to sensationalize anything. But once the facts became apparent to me, I knew I had a responsibility to present them as best I could to my readers. Anything less would have been the coward’s way out. Last night I discussed the matter with a friend of mine who has attempted suicide more than once. I visited her in hospital following her last attempt. She was shocked that in this day and age the stigma attached to depression would make an honest discussion regarding depression and of suicide so difficult. She asked if I had known that incidents like this were to occur, whether I would have written what I did.